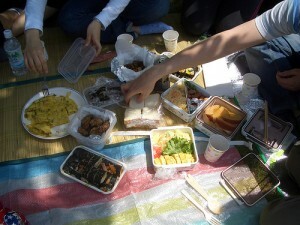 There is real humanity in the potluck picnic. Or rather, a humanity that is real: personal, physical, unmediated. Yesterday, after our annual, end-of-the-year elementary public school music program, the families of students in the the mixed-age (K-6) classroom (which our children have attended for the past three years) gathered for the annual picnic. The school is two blocks away from a large beautiful public park and so we all just walk on over and set up potluck and the kids go play: tag, red rover, stream exploration, you name it the kids are off being kids and having fun. Plus the weather couldn’t have been nicer. It started about 6:30 and families stayed as late as 9:30 pm. That is life lived well. Adults talking and sharing life stories and kids playing, running, jumping, yelling, dancing. Why is this not a constant? Isn’t this nearly a perfect mode of human living? nice one. Sounds like a lovely afternoon. Those unscripted experiences linger in your thoughts. It is simple enjoyment of the basics–food, company, conversation, play. What more do we need for happiness?